Camptotheca acuminata (C. acuminata) is utilized in preparation of drugs and as constituent in functional foods of China due to high camptothecin (CPT) content in different plant parts. Light intensity is one of the most critical factors which affect plant growth and secondary metabolites. 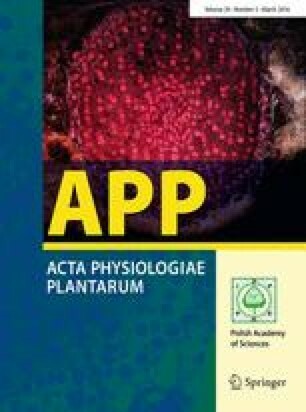 Pot experiment was conducted to study the effect of light intensity (i.e., 100 % irradiance (control), 75 % irradiance, 50 % irradiance and 25 % irradiance) on contents of CPT, activity of enzymes and genes expression related to CPT biosynthesis of C. acuminata seedlings. The study examined total leaf biomass, CPT content, activities of tryptophan synthase (TSB) and tryptophan decarboxylase (TDC), and relative expression of TSB, TDC1, and TDC2 genes. Plants grown in 75 % irradiance possessed the greatest leaf biomass compared with 100 % light irradiance. Highest values of CPT contents were found after 60 days in plants grown in 50 % irradiance, followed by 25, 75 % and full sunlight. Furthermore, activities of TSB, TDC and relative expression of genes of TSB, TDC1, and TDC2, were significantly increased after 60 days of 50 % irradiance compared with full sunlight. Irradiance of 50 % up-regulated the expression of CPT biosynthesis-related genes and induced CPT biosynthesis. In addition to that lower or higher irradiance inhibited the expression of CPT biosynthesis-related genes and CPT biosynthesis. It is concluded that manipulating light intensity can be an effective means to achieve highest CPT yield in medicinal plants. Y. Hu and W. Yu contributed equally to this work. Thanks are extended to Professor Mohammad Shafi from the University of Agriculture Peshawar and LetPub (www.letpub.com) for professional English improvement of the paper. The research study was supported by Zhejiang Provincial Natural Science Foundation of China (LZ12C16001.